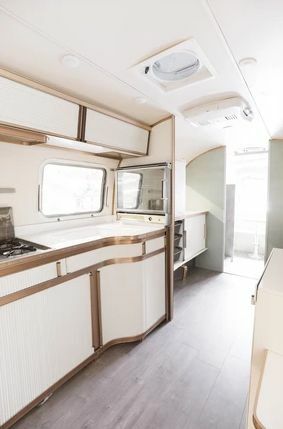 Mountain Modern Airstream helps tiny home lovers create their dream space by sourcing, renovating and decorating vintage Airstreams. 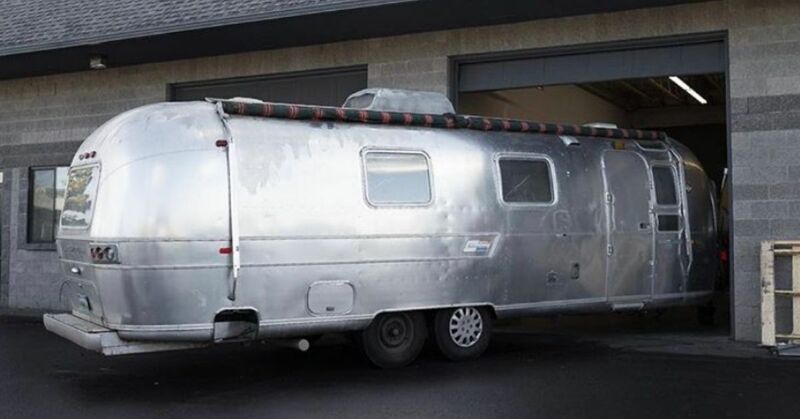 In the case of "Susan," this 1972 29-foot Airstream Ambassador, the company checked all of the boxes by finding the vintage RV and transporting it back to Bend, Oregon, to restore its former glory. Co-owners Damian and Anna rebuilt much of the original design and updated the living quarters. The finished result serves as a combination home office during the week and family adventure mobile on the weekends. 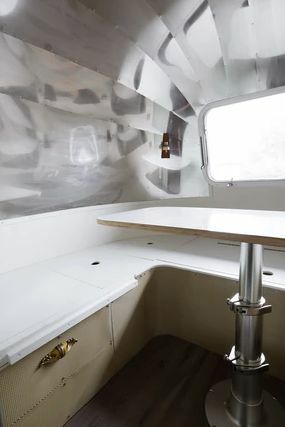 An homage to the original, the front seating area is clad in aluminum siding and doubles as a dining room and sleeping space. The table features a telescoping base and a laminate top by Octolam. 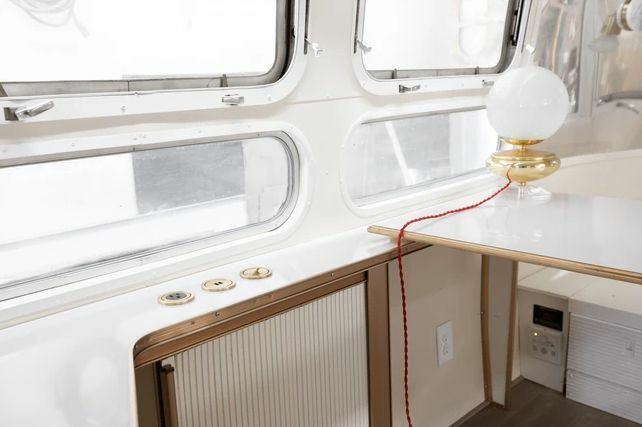 With the table removed, detailing below the dinette expands to create a cozy bed. 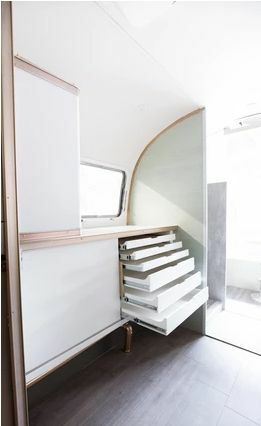 Also an efficient office, the Airstream features a light switch, power outlet and double USB port. Brass electric fixtures from Juniper Design are as stylish as they are functional. In the kitchen, premium fixtures include a Kraus faucet, Houzer sink and a dometic refrigerator. Sleek brass detailing accents white cabinetry and bright quartz countertops. Across from the range, an expansive desk is an extra working area for the homeowner's office. Next to the kitchen, a roomy countertop offers additional prep space above built-in drawers. Laminate oak flooring creates a sleek profile throughout. Sage Philip Jeffries grasscloth wallpaper creates a chic accent. In the bathroom, the sink area includes a vintage school drinking fountain and antique wall sconce. 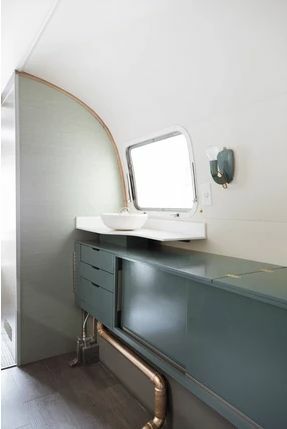 The roomy vanity is painted in teal above an exposed-brass pipe. 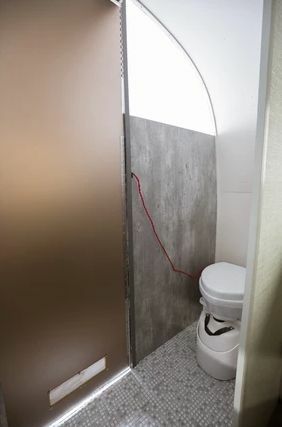 A private toilet area features a Nature's Head Composting Toilet and laminate walls from Octolam.